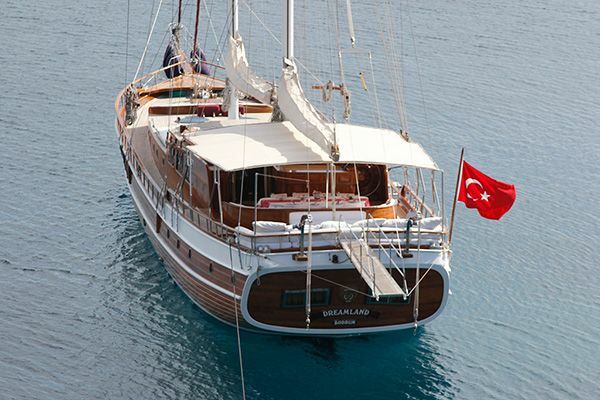 The beautiful luxury gulet Kaya Guneri 5 is an impressive modern classic in the VIP class of traditional Bodrum gulets. 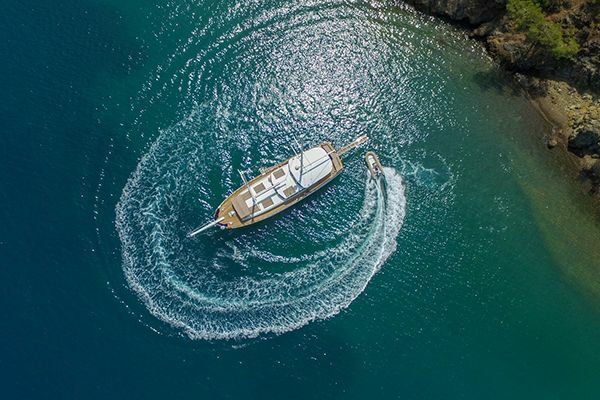 With the vast deck space afforded by the sweep of her 39 meters long hull, guests enjoy the luxury of exclusive privacy aboard their own floating getaway, tended to by a professional and experienced crew who are at once friendly and discrete. 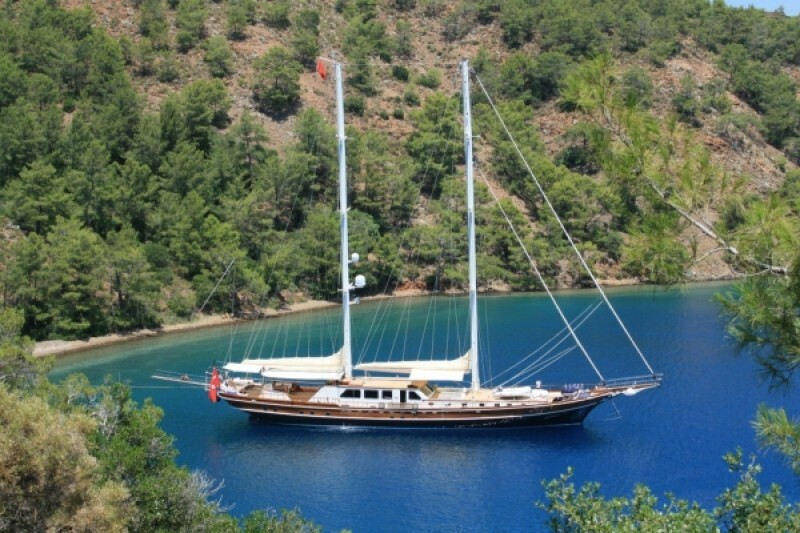 As locals the captain and crew know the Turkish coastline and nearby Greek islands for all the favorite bays, and interesting villages, perfect for exploring or being far away from it all. 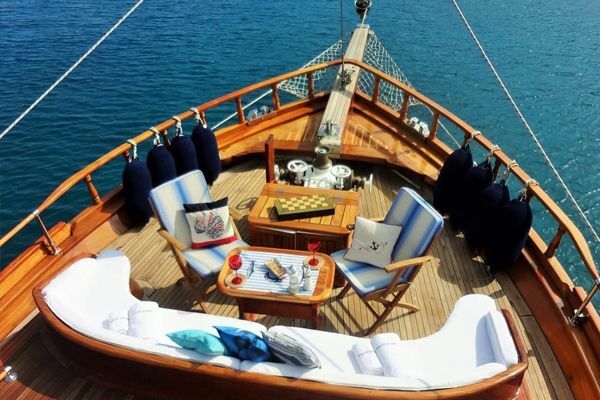 For those guests who enjoy an uncluttered nautical style with space and efficient well-appointed features, the Kaya Guneri V is the best value luxury gulet option for larger groups of family or friends of up to twelve guests. 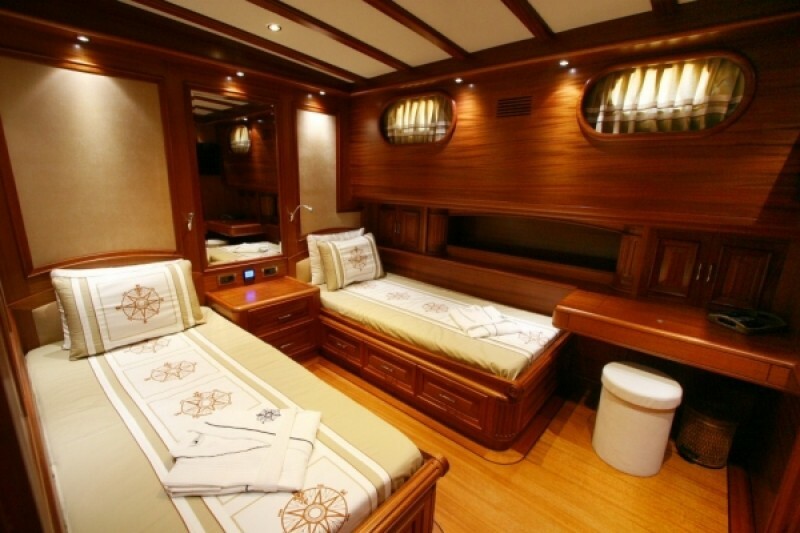 The two spacious master cabins are placed fore and aft, enjoy excellent headroom and offer all the luxury features of a VIP Luxury gulet; queen – size beds, side leather upholstered settees, TV with satellite, personal safe, vanity desk, copious storage space, and personal bathrooms in this case with WC and bidet, and a fully marble-lined shower alcove with a marble seat. 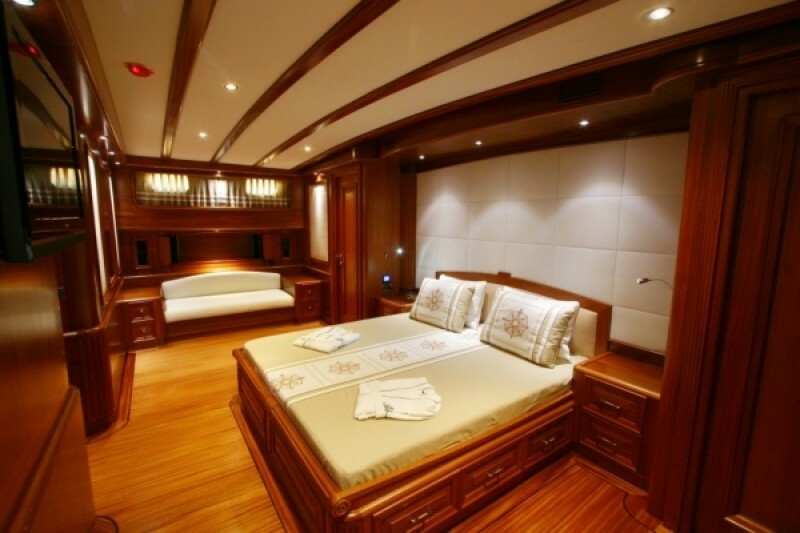 The largest master cabin to the front of the gulet, also offers a full walk-in closet. 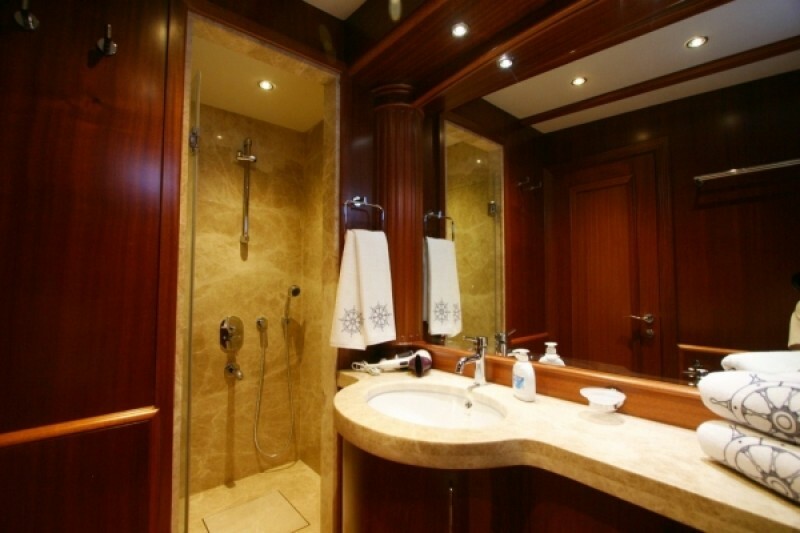 The guest double bed cabins have space to offer walk-around beds, and a side settee, along with the fully marble lined private bathrooms, while the twin bed cabins have full-size comfortable beds and well-appointed marble lined bathrooms. 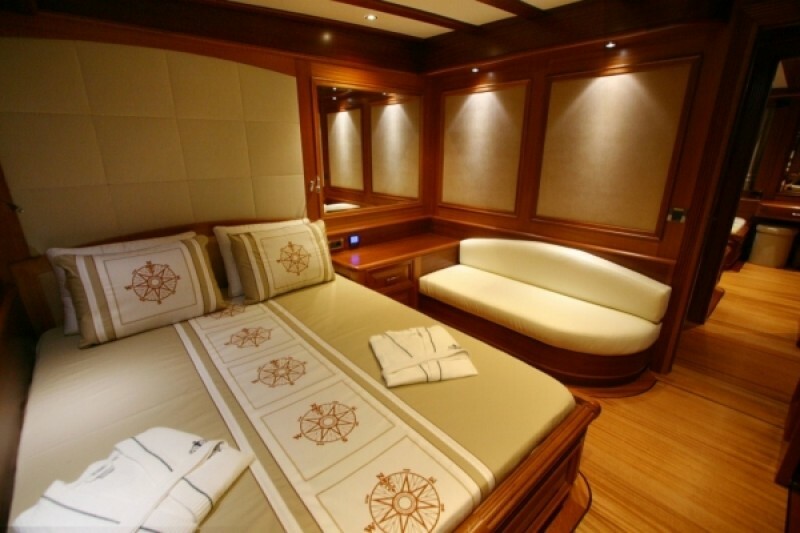 All cabins have good headroom, are fully air-conditioned, and are fitted with LCD TV, DVD, CD and MP3 players. 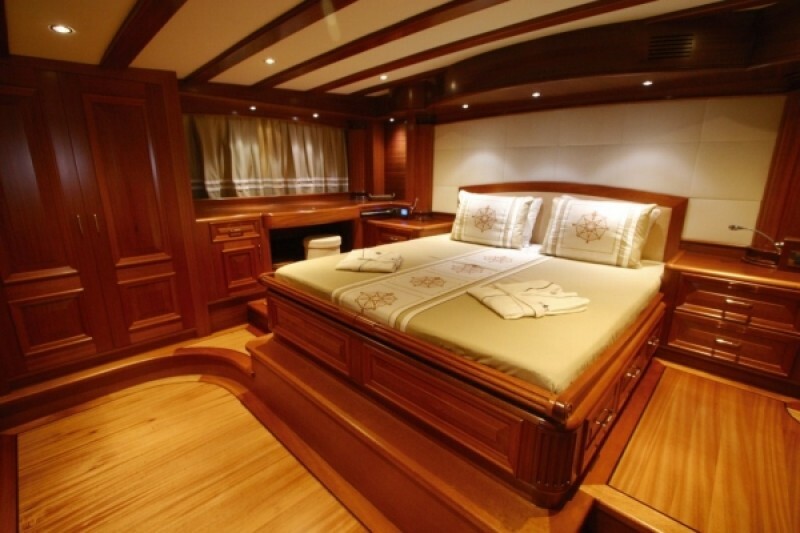 The allocation of a master cabin, one double bed cabin and one twin bed cabin in a group to the fore and another aft allows private areas for guests below deck. 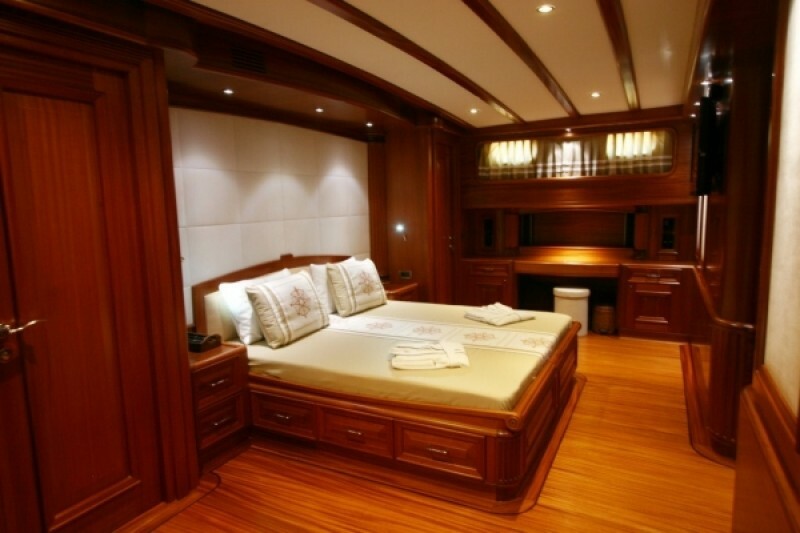 As in the cabins and corridors, the elegant saloon glows with the rich tones of mahogany and other woods offset by settees and chairs in white leather, and a superb full dining table that excels as a formal entertainment setting. 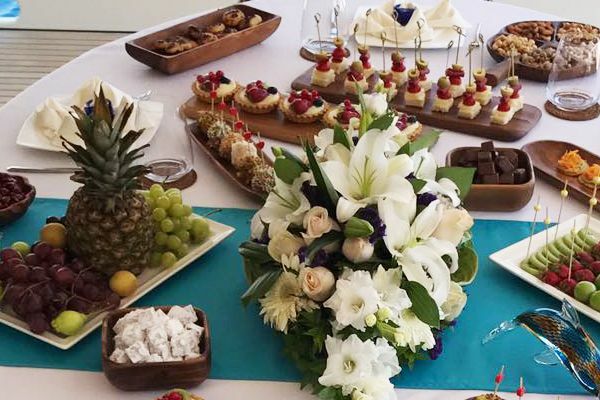 The saloon has a full service bar and access to the fully equipped galley below where the chef prepares the superb menus for the cruise. The saloon may also be the focus of indoor leisure and the entertainment center where a full sized LCD TV screen with Satellite, DVD, CD and MP3 player, Hi-Fi music system and Wi-Fi internet are available. The guests’ playground is absolutely the vast deck space, in the fresh air and with views over the water wherever they are. 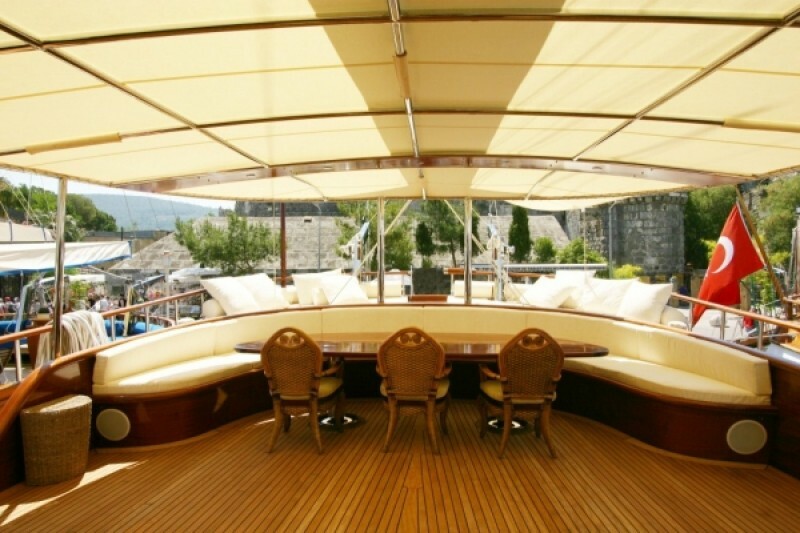 The choice of relaxing on the wide cushion pads across the stern under the shade of the awning, relaxing on the cushions at the outdoor dining table between leisurely meals, or on the fore deck on sunbeds or on the ever-inviting bow seat taking in the views. 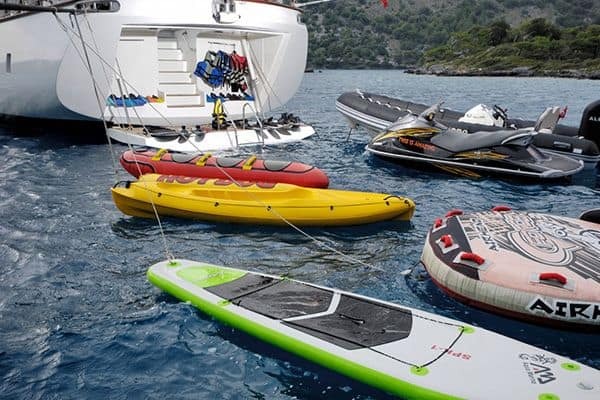 If not relaxing the toys for playing in the water are ready for the crew to put at guests’ disposal: the canoe, boards, and the toys for the motorboat - waterski, ringo or jetski ready to be winched off deck. 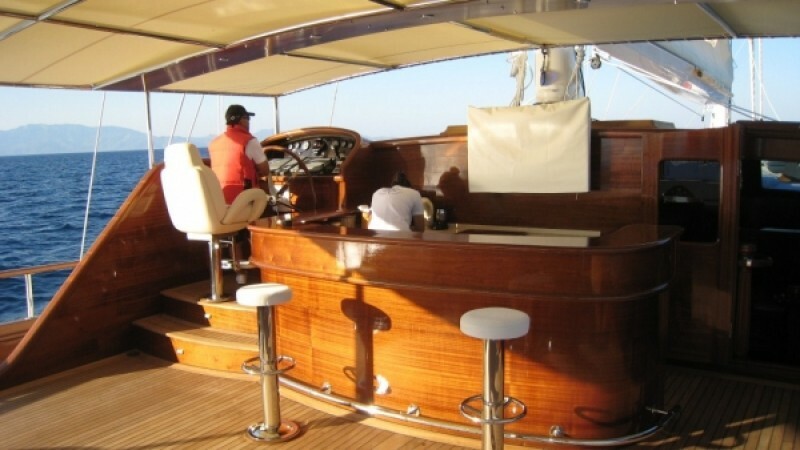 The crew will also set the sails, just enough to share the most delightful experience of being under sail on a grand luxury gulet along the Turkish Mediterranean coast or among the Greek Islands.